Costa Rica officially the Republic of Costa Rica (Spanish: Costa Rica or República de Costa Rica), is bordered by Nicaragua to the north, Panama to the south, the Pacific Ocean to the west and south and the Caribbean Sea to the east. Costa Rica, which means "Rich Coast", constitutionally abolished its army permanently in 1949. It is the only Latin American country included in the list of the world's 22 older democracies. Costa Rica has consistently been among the top Latin American countries in the Human Development Index, ranked 62nd in the world in 2010, and is cited by the UNDP as one of the countries that have attained much higher human development than other countries at the same income levels. The country is ranked third in the world, and first among the Americas, in terms of the 2010 Environmental Performance Index. Costa Rica has bewilderingly diverse landscapes, flora, and fauna. From rain forests, to dry tropical and temperate forests, to volcanoes, to Caribbean and Pacific beaches, to high mountains, and marshy lowlands. 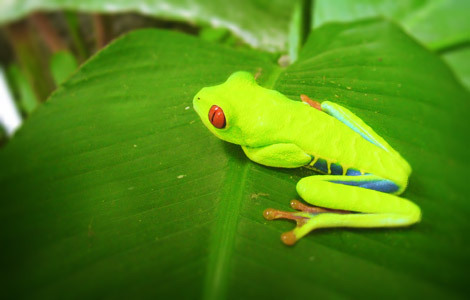 Costa Rica is one of the world's most popular destinations for eco-tourists because of its biodiversity. It has been stated in various places that Costa Rica may contain as much as 6% of the world's plant and animal species in an area the combined size of the U.S. states of Vermont and New Hampshire. Both tropical plant and animal species abound in Costa Rica. Some of the more impressive plants range from huge ficus trees with epiphytes abounding on their limbs to approximately 1500 different orchids. The animals are equally as impressive, whether it's a jaguar, the ever-elusive Margay, or the wonderful birds like the green or scarlet macaws. The amphibians are also quite impressive; the poison dart frogs with their bright colors are bound to catch your attention, or the giant cane toads. Because Costa Rica is located between eight and 12 degrees north of the Equator, the climate is Tropical year round. However, the country has many microclimates depending on elevation, rainfall, topography, and by the geography of each particular region. Costa Rica's seasons are defined by how much rain falls during a particular period and not to the four seasons in the Northern Hemisphere. The year can be split into two periods, the dry season known to the residents as summer, and the rainy season, known locally as winter. The "summer" or dry season goes from December to April, and "winter" or rainy season goes from May to November, which almost coincides with the List of Atlantic hurricane seasons and during this time, it rains constantly in some regions. The location receiving the most rain is the Caribbean slopes of the Central Cordillera Mountains; with an annual rainfall of over 5000 mm. Humidity is also higher on the Caribbean side than on the Pacific side. The mean annual temperature on the coastal lowlands is around 27°C, 20°C in the main populated areas of the Central Cordillera, and below 10°C on the summits of the highest mountains. Most flights arrive in San José, (SJO) which is near the centre of the country and the hub of public transport. It is often easier to go to one region and then return to San José to find transportation to another area. However depending on what part of the country you are in there are some local hubs you can travel to get to another city in that same region. The majority of Costa Ricans do not own cars. Therefore, public transportation is quite good and you can get buses to almost any part of the country. Remote or small towns may be served by only one bus a day, but you can get there. Keep in mind that even though these buses may seem to run on a relaxed schedule they do leave on time and they will leave you behind even if you bought a ticket in advance. Car rental is popular and relatively easy, a car can get you places you can’t get to by public transportation and Costa Rica has so many must see places off the beaten path. Having a car also gives you the freedom to travel when you want and to stop wherever you like. As buses to remote areas are not very frequent, you can cover more ground in a shorter time with a car. Driving at night especially on mountain roads is borderline suicidal one encounters large trucks on small roads with a lot of blind corners, fog, impatient and reckless drivers passing slow trucks, my advice, find a cozy inn and hole up till daylight. There is so much to see wherever you drive why drive at night and miss so much. There is also the light aircraft option, both Sansa and Nature Air offer packages where you can have unlimited flights for one or two weeks for one flat price. Both outfits have a good reputation and operate well maintained Cessna Caravans. There are about 15 or so airstrips that these airlines service. Costa Rica is the ideal destination for just about anyone, from romantic honeymooners, wildlife enthusiasts, families, beach lovers, mountain lovers, bird lovers, adventure seekers and just those who want to relax in one spot. Do not put Costa Rica on your “bucket list” just come and stay a spell, your body and mind will thank you.